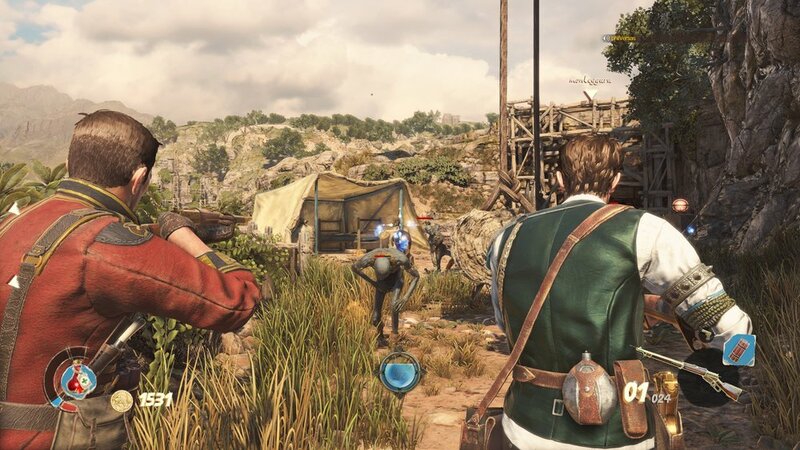 Strange Brigade by Rebellion is a third person action-adventure set in a steampunk style 1930s, which features 1-4 online co-op, a variety of weapons, traps and puzzles. It’s available on PC, Xbox 1 and PS4, usually for around £25.00. The setting is Egypt, where an ancient evil force, Seteki the Witch Queen has been unwittingly let loose by an archeologist. It’s the job of the Strange Brigade, made up of Nagala Rushida (African tribeswoman), Frank Fairburne (sharpshooter) Professor De Quincy (Scholar) and a Manchester factory worker Gracie Braithwaite. Each have their own starter weapons, and have a different powered up attack which you get by killing a variety of nasties. The game itself looks pretty enough, and plays very similarly to Rebellion’s own Sniper Elite series but without slow motion replays of internal injuries. I played mainly as Nagala, as she seemed to have the best starter weapon, also after finding a power-up, I discovered that I could take a lot of enemies out with one shot. These weapon power-ups are difficult to find and in four stages I only managed to get the one. This is due to the nature of the puzzles in the game which have locked doors hidden by symbols that have to be opened in a variety of ways. Some of these are very obvious, some seemed completely random and you only get 3 chances before the door gets locked for good. The quantity of enemies, mainly mummies and giant scorpions, can make the game a bit of a slog and you have to clear all of them in a certain area before moving on. There are some traps like spinning blades and spikes dotted about that you can shoot to activate, and occasionally you’ll pick up other weapons like grenade launchers which can help, but often the sheer weight of numbers makes it hard going. Ammunition dumps are quite well dotted around and your character’s pistol has infinite ammo but is really only good for setting off traps as it’s very weak. It’s the constant mowing down of the same creatures, together with a pretty but repetitive set of backgrounds that makes this game best played in multiplayer, as in one-player the puzzles aren’t amazing and you’ve basically seen all of this done before. The game starts with bright colourful menus and thumping techno music (though I am old so it could be any one of the millions of thumpy noises them kids listen to these days). Your avatar has the super-deformed big head anime look and has literally billions (10 billion combinations according to the publisher) of outfits, hairstyles etc. so you could spend hours dressing your little bomberperson. Also there are loot boxes you can buy for real money full of outfits and numerous other stuff. There are ten game modes such as Free for All, Team Deathmatch, Treasure Mode (coins are sometimes released when bombs go off) and Zombie Mode, which turns any dead players into zombies who can walk through blasts and infect other players. Lots of Power-Ups are available to increase Speed and Bomb Range, as well as Ultimates which offer other abilities like being able to throw or kick bombs across the screen. The one player mode has 240 levels divided into 7 zones like Jungle, Pirate Ship and a Disco dance floor. The multiplayer options cover 283 levels across the 7 zones and allows up to 32 online players at the same time. Victory are targetting this as an esport, and like other esports games the PC requirements are minimal, listing only a Pentium with 512Mb graphics needed to run it (though I wonder how well such a machine will handle 32 players on screen at once) and I had no issues running it at a good speed with my somewhat-overkill Ryzen 7 and GTX1080. So, aside from loot boxes, costumes and hundreds of levels, how does it actually PLAY? Very well in fact, super smooth with bright colourful graphics and a good learning curve so even someone not good at Bomberman in the past can get a good game in. The one player game has a good variety of challenges and is a good way to train you for the multiplayer, which is where the long term fun is to be had. Having a screen full of characters and bombs going off in all directions really is a lot of fun with friends, and the deep customisation and many game modes really reward extended play. 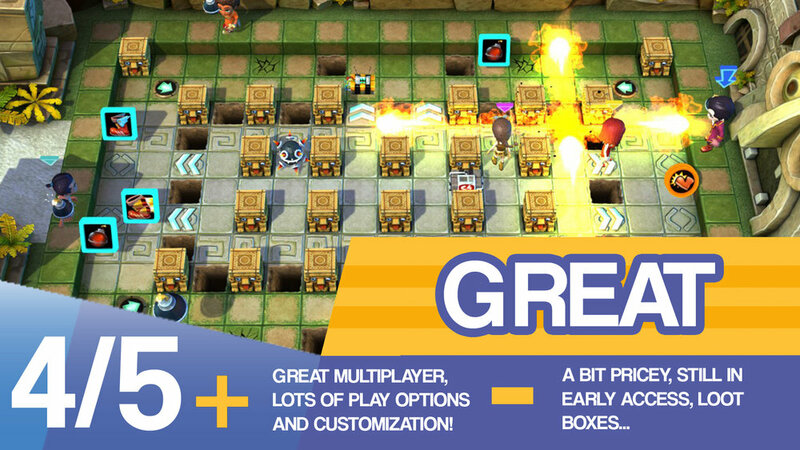 It’s not cheap at £15.49, but there is a lot there if you enjoy Bomberman and multiplayer gaming in general. So, if you liked Bomberman you’ll love it, if you didn’t this won’t change your mind. Bombslinger is the latest game by Mode4 and while being available through Steam's Early Access program for a couple of years now, the game launches proper on Xbox One, Playstation 4, PC and Nintendo Switch today. We'll be taking a look at the Switch version of the game for this review. 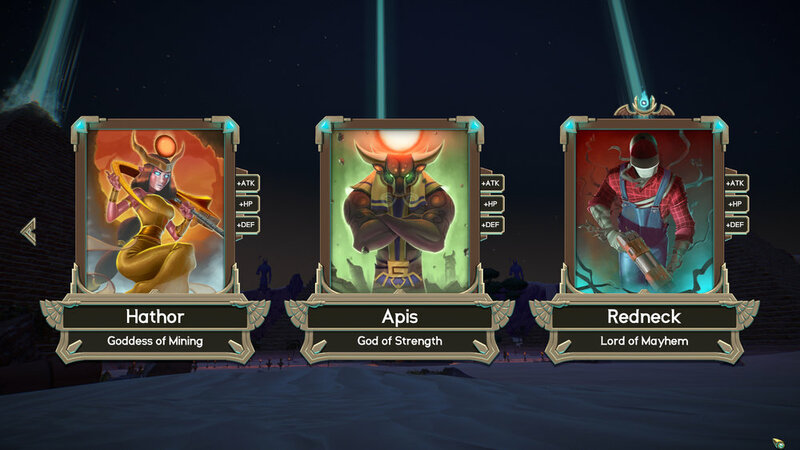 Personally, I'm not into story-driven games these days, so you could say Bombslinger is a perfect match for me with it's firm emphasis on multi-player. The game does however have a story-mode and luckily for me, it's a welcoming and fast-paced affair that follows a straight-forward storyline with a nice quick intro before throwing you into battle. Now let's get on with hog-killin' time. You play as a poncho wearing bombslinger in a Bomberman / Smash TV style'd game. 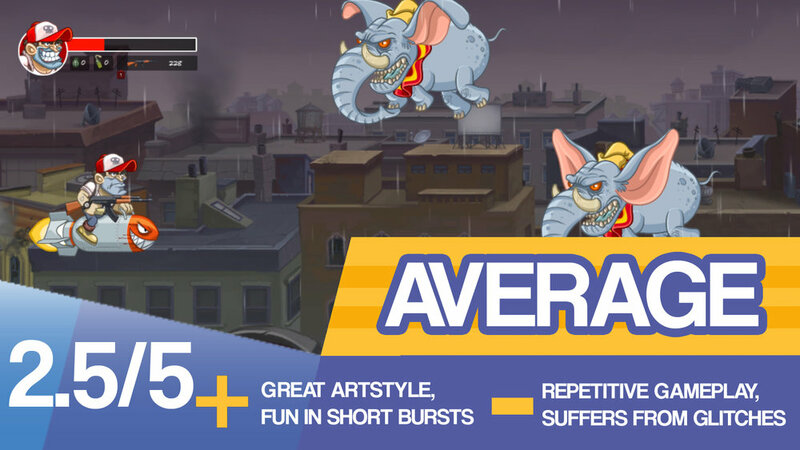 One glance of Bombslinger and you'll more than likely be familiar with the gameplay mechanics, but there's much more to the game than successful bomb placement and you'll need to have your wits about you if you hope to succeed. The aim of the game is to defeat all enemies within each room and in doing so different areas will open up for you to choose your path to the next randomly generated room. Along the way you'll come across bonus rooms with locked chests within, requiring a key to open. A final room will pit you against the boss for that stage. Along the way you'll encounter a bunch of different enemies to take down, while gaining coins for doing so. This will then enable you to explore shops that are located around the different rooms and inside you can purchase weapons and power-ups, you'll also gain the ability to select new power-ups with the use of XP that is accumulated throughout the game. All sounds easy right? Drop a few bombs, gain some power-ups, then learn the bosses movement patterns and 'bomb's your uncle'? In practise, the answer is No, this game is hard – well, at least for me. Upon dying you'll be taken back to the very start of the game, and while you do have a couple of lives that are indicated by hearts, it's only the most precise and experienced players that will get to experience all that the Single-Player game of Bombslinger has to offer. However, as previously mentioned, Bombslinger offers a robust selection of multi-player modes for up to 4-players, this will be the game mode I think most players will relate too, and it's what the Switch is perfect for. You can check out our video below to see the multi-player in action! So, Bombslinger...is it a bombing good time? I'm a little torn. 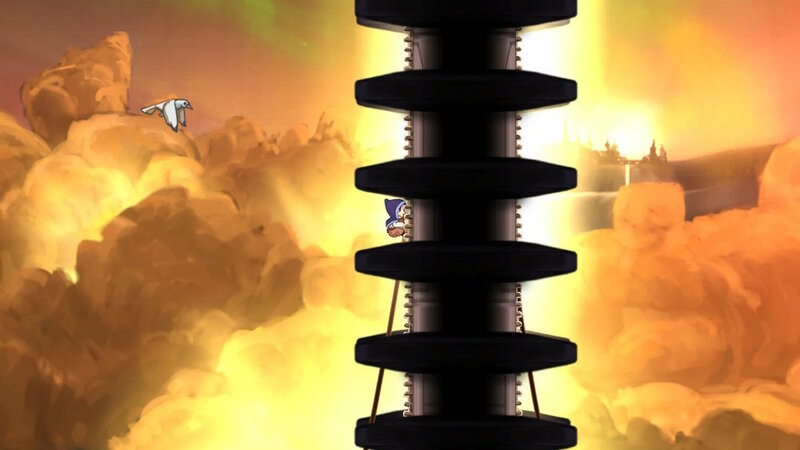 On one hand we have the steep difficulty curve of the single-player mode, this is mainly due to the fact that you can't continue from where you left off but then the game is also about progressing and levelling-up while gaining new abilities, so this does help alleviate some of the game's difficulty level if you stick at it. On the other hand we have the pickup and play aspect of the game, with very quick loading times across all game modes, the fantastic presentation, decent music and the hectic but fun multiplayer mode. If Bombslinger sounds like your bag, then you can pick it up from the Nintendo eShop for £10.79. 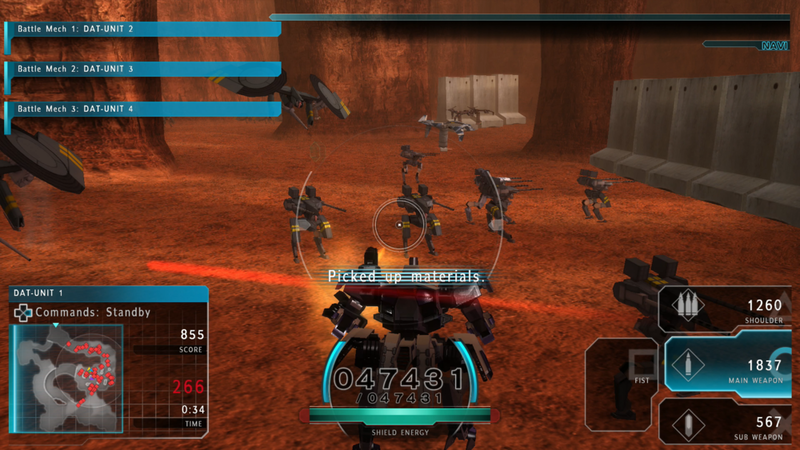 Take your team, consisting of 3 other MECHS, into battle against wave upon wave of mechanical enemies. You have a variety of weapons at your disposal, each of which can be selected with one of the four controller face buttons. The D-pad takes care of issuing your squad with orders, should you want your teammates to Attack, Standby, Defend or Hold Position. 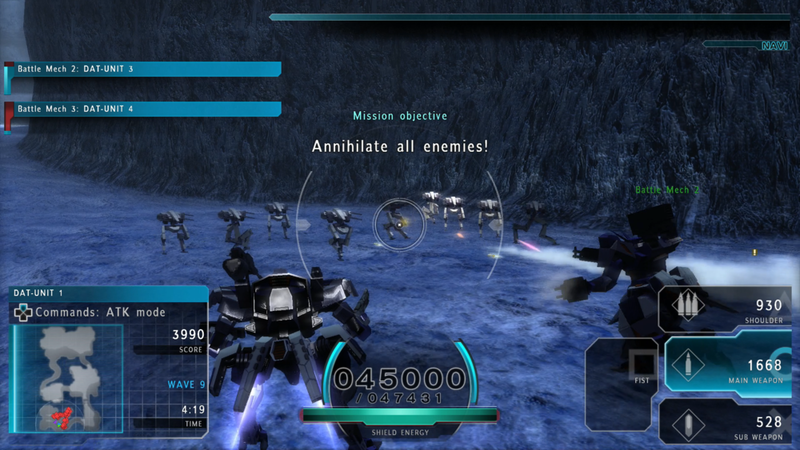 Once defeated the enemies usually leave behind Development Points (to be used to upgrade your MECHS) and various recovery items. Mission Objectives shake up the routine of blasting, these can range from securing all the points on a map to completing a mission under a certain time limit. Achieve the objective and it’s onto the next Mission. Do you like MECHS? Do you like shooting stuff? If you answered yes to those two questions then you‘re probably the target audience for this game. 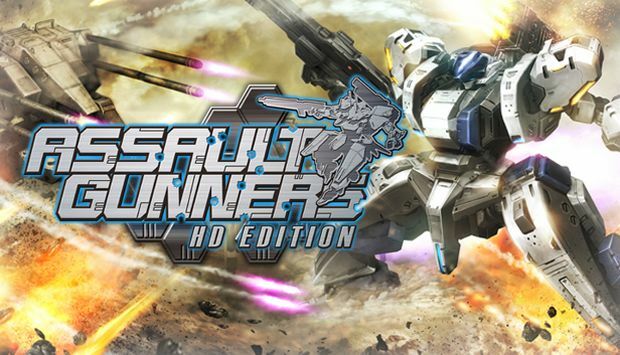 Assault Gunners HD is a port of a PSVITA game that was released exclusively in Japan back in 2012, it’s taken 6 years for it to land on our shores and the question is, was it worth the wait? Before going into this game, it’s best to lower your expectations. However, it mostly succeeds to deliver what it promises, namely plenty of missions, lots of blasting action and a large dose of customisation. First impressions aren’t great, the game manages to look blander than bland and the first few training missions don’t do much to persuade you that there’s much fun to be had here. 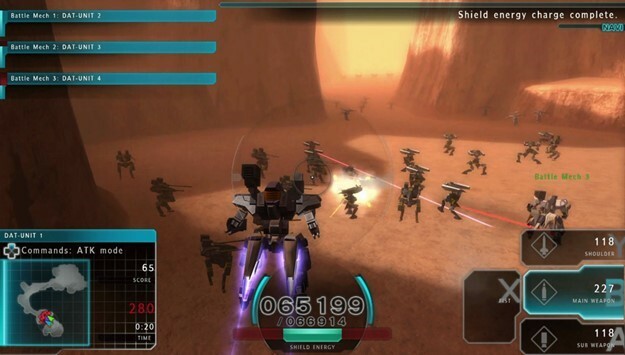 At first the gameplay appears to follow a similar template to the Dynasty Warriors series, only with Robots instead of the usual Japanese feudal heroes you may be used to in a game like this. Unfortunately destroying your enemies isn’t a particularly satisfying affair, you have a choice of which weapons you want to use to deal out the damage but I found myself sticking with the powerful homing missiles for the most part. Although, the flurry of rockets is reasonably exciting to behold at first, the enemies sadly just seem to disappear in a rather lacklustre way once taken out. There’s a hint of some sort of strategy element to the gameplay, however for the early missions you don’t need to think too much about that, later however, as missions get steadily more difficult I couldn’t help thinking that I was missing the strategic edge that seemed to be needed to successfully complete the objectives. I never quite got a handle on managing my units effectively and the parts I’d developed to customise my MECH and those of my team, didn’t seem to helping my progress. I tried in vain to to make proper progress in the game, perhaps I’m meant to fail the same mission over and over again for the sake of collecting more points and eventually levelling up enough to achieve the objective? I never quite worked out what I was doing wrong. At least customising the MECHS is fun, despite their generic design at the beginning of the game you can unlock some cool alternative parts and at least make them aesthetically pleasing enough. At first I thought I was going to really dislike this game, after all it doesn’t give the best first impressions but as I began to progress in the game and discovered the fun customisation options, I really felt that I was starting to get into it, zooming around blasting stuff was fun for a while, but I was soon faced with the realisation that the core gameplay just couldn’t hold my attention. The game eludes to having some sort of depth but this was either hidden deep behind the barrage of stats and numbers that the levelling up system throws at you, or Assault Gunners HD is just simply not the deep technical gaming experience it seems to be eluding to. 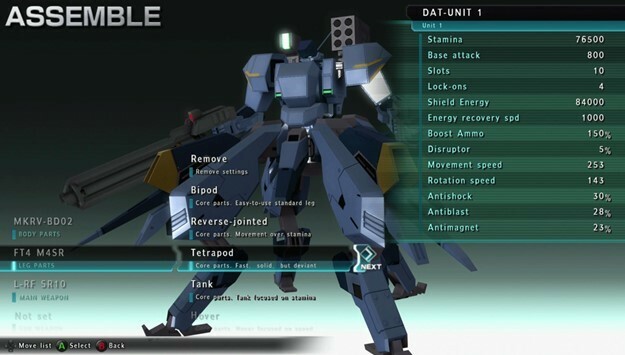 Unfortunately Assault Gunners HD doesn’t just suffer in the gameplay department. It’s story is nonsensical, it’s graphics are below par and the controls could be a little more intuitive, although not terrible by any means. The game’s music is is also instantly forgettable and while it does contain some spirited Japanese voice acting, none of it is subtitled. This isn’t a bad game, you can have some fun with it, it’s just incredibly average in nearly every way. At least it’s reasonably priced at £7.99 for the basic game and £9.79 with some extra missions. If you like Dynasty Warriors type games and have a love of MECHS you may get a fair amount of enjoyment from of this game, especially when you factor in the customisation side of things, just don’t expect too much. Overall it’s just tough to recommend this over the ton of other more polished and enjoyable games available on PSN for the same money. ASSAULT GUNNERS HD EDITION is out now on both PlayStation®4 and PC with three purchase options available. You know that bit in Top Gear (before Joey joined) when they would have to complete a task by creating something? Memorable examples being the sea going cars and the hovercraft... well this game is a bit like that. So imagine that Jeremy, James and Richard have created a game; but their total game-playing experience is limited to Duke Nukem, Serious Sam, with a dash of Rogue and the single exposure to Gauntlet Legacy. Now you’re thinking that, this is just my way of being polite, since their endeavours rarely worked out for the best... well no - this is actually rather good. The redneck of the title is a tourist who ends up dead after an accident and is handily reincarnated next to a series of pyramids which have to be tackled - using assorted weaponry. So all pretty standard then. Controls are smooth and can be redefined although the initial arrangement is fine enough. The targeting reticule changes to match the equipment ordinance and various ammo/health refills are earned as you play. It’s all quite jolly with a pleasant front end as well but that does lead me into the first couple of things that do annoy. Iconography can be tricky to read, even on a really really big screen (technical term). The same can be said of the map. This functions quite well but the legend/key is a little small for quick reference. After playing the tutorial the game starts; however I would have preferred that the tutorial also covered the gameplay as well since it can be awkward to fathom exactly what is going on with a certain degree of confidence. The redneck angle is ultimately just there for the comedy aspect but the Egyptian theming is however a corner stone of the game design and looks good. The game is played as a series of interconnecting multilevel rooms with special staircases joining up the internal levels. As you reach the apex you face the boss at the top of the pyramid. 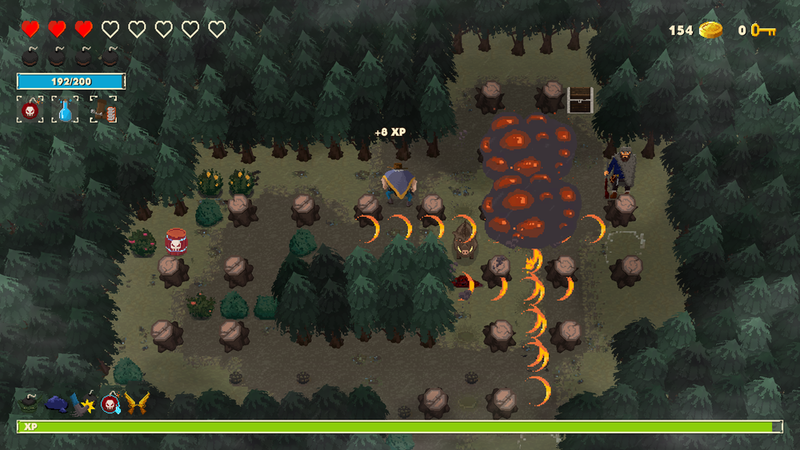 All the foes have their own attack styles and some are spawned from generators. Hidden chests can be found and scrolls acquired to present random perks (although not all are good for you). The internal pyramid structure is created randomly each play though using standard rooms; these rooms once entered cannot be left until they have been cleared (usually of foes). Each room is consistent so that each time you encounter it you can reuse any strategies that you have formed. A cleared room can be re-entered without penalty which is handy since the random nature of the levels will create many routes – some of which will be dead ends. Also any dropped weaponry can be retrieved if needed. You have little to no chance of completing the game on your first or even 51st attempt. To get somewhere you have to upgrade your stats using gold obtained from your previous play. As upgrades are purchased, further branches are made open to you. Purchased upgrades can be further enhanced with more gold; this has to be done in order for certain branches to be made accessible. However as you progress bigger and bigger amounts have to be handed over in order to unlock the full tree. As you progress other characters can be unlocked on the skill tree - each with slightly different strengths. One annoying feature is that by re-entering the pyramid, your gold is set to zero so you cannot save up for upgrades and if you try to manage your gold in order to get the most for your money you’ll discover that the unit prices will change as you make each purchase; so usually spoiling any carefully crafted plan. The controls are good and targeting is very accommodating, even when you are moving at speed.Graphically, the game walks the fine line between detail, character and recognition very well, although the iconography can be hard to read on the maps until you get used to it. Credit must be given to the music, which is very good and not invasive. As per usual with modern download games you are dropped in at the deep end. So, even games with relatively straightforward goals and objectives require a lot of play in order to get a good understanding of the mechanics (assuming you have a rounded gaming experience of course). It would have been nice if the game had a gameplay tutorial; even if it was an old fashioned attract screen that you used to find on arcade games. IMMORTAL REDNECK DEVELOPED BY CREMAGAMES AND IS AVAILABLE NOW AS A DIGITAL DOWNLOAD FOR XBOX ONE (£15.99), PS4 (£15.99) AND PC (£14.95) WITH A SWITCH VERSION TO FOLLOW. 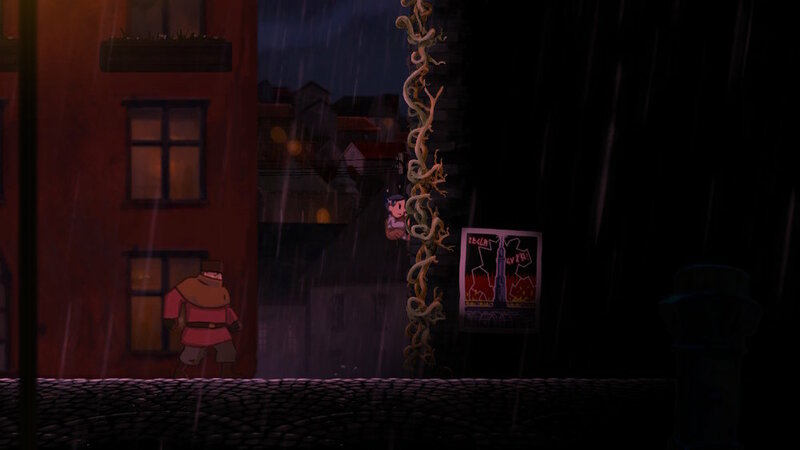 Teslagrad by Rain Games was first shown in 2013 and since then its become available on a whole host of formats over the years, and now the Nintendo Switch. December the 7th marks the release of the Nintendo Switch version but is it worth another visit? You control a young boy who's found himself being chased by the Kings guards, ultimately forcing you into the surrounding area of the Teslagrad Tower and within. The game itself doesn't showcase what you're doing or even where to go, apart from slight hints but that's what makes this puzzle-platformer such a joy to play. Throughout the game you'll gain new abilities that will help you explore and solve at first, confusing and 'how do I do this?' puzzles but without instructions. As a handheld version the concept really does work, pickup, play and continue where you left off. This is what makes the game fun to play and enjoyable. Switching to docked mode and replacing the joy-con remotes with a pro controller will help you out in the later levels, some parts get very tricky as you're ability to change power-ups and precise movements are key but Teslagrad feels at home on the Nintendo Switch. 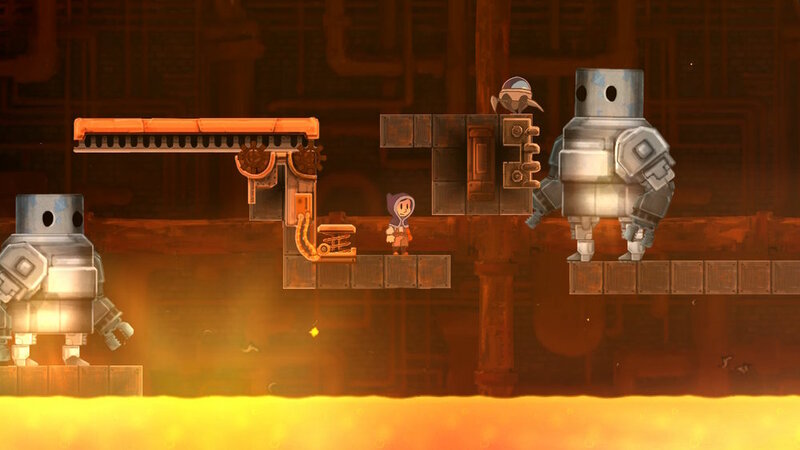 The hand-drawn environments and art style of Teslagrad, along with it's what appear to be mind bending puzzles transform onto the Switch perfectly. Addition of the handheld mode on the Switch, this is the best version of Teslagrad. I recently picked up a Nintendo Switch and for me, it was natural to also buy Nintendo's Pro controller. Having played with the Switch Joy-con controllers and its grip that makes it feel more like a standard controller, I still needed something that was more comfortable from the beginning. This brings me to CHIN FAI Nintendo Switch Pro Controller Grip. I wanted some kind skin to help protect and keep my controller having that 'new' feel. The product came nicely packaged, instead of a lose rubber jacket in a zip-up bag that I've come across before and the contents include 4 different designs of replacement thumb stick grips. As you can see from the photos the skin fits perfectly onto the Switch Pro controller and doesn't get in the way of the functions of the buttons, sometimes you find skins slightly overlap the buttons or even worse, interfere with the analogue sticks when rotating them but the CHIN FAI grip has been grafted to fit. The grip doesn't have any baggy sections of any kind and fits like a grove with no movement. The CHINFAI Pro controller grip can be brought from Amazon for £8.99. To summarize G.E.M (which is one hell of a great acronym by the way) would be to say it’s a side-scrolling shooter, played out in a continuously scrolling environment where the goal is to take down the on-screen enemies before they take you down. This however would be selling G.E.M short as it does this with a finesse you don’t always see in games of this genre. At first, I thought a good comparison would be Fantasy Zone, a Sega classic with a similar gameplay style, in reality G.E.M probably has more in common with the Arcade classic Defender, albeit functioning on a completely different level. The layers of strategy at play here, coupled with precise and responsive controls result in nothing short of pure Arcade-style gameplay bliss. 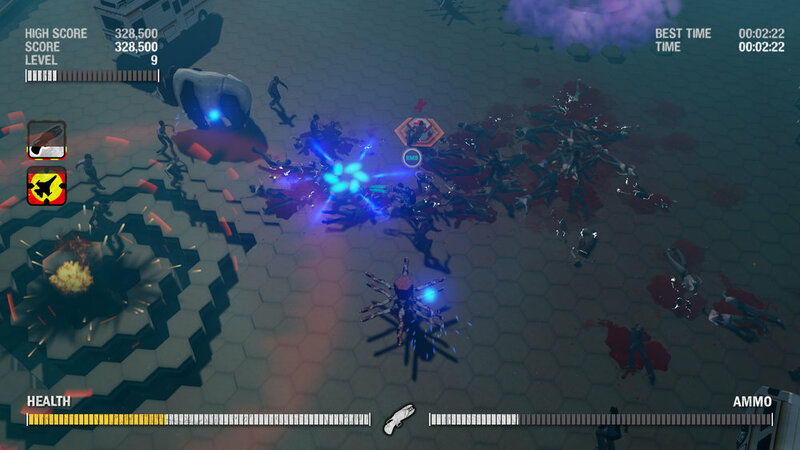 Rather than just doing away with your enemies with just a simple laser, G.E.M provides you with a range of different offensive options and depending on the situation, or enemy type, you’ll want to vary your strategy accordingly. Weaker enemies can be done away with quickly just by using the standard laser. If they swarm you however there is no need to despair, as you have your Energy Sword, which can provide a swift swipe around the vicinity of your ship to keep the marauders at bay. A stronger foe giving you trouble from afar? Fear not, as you can always rely on your Sniper Beam to take them out from a safe distance. 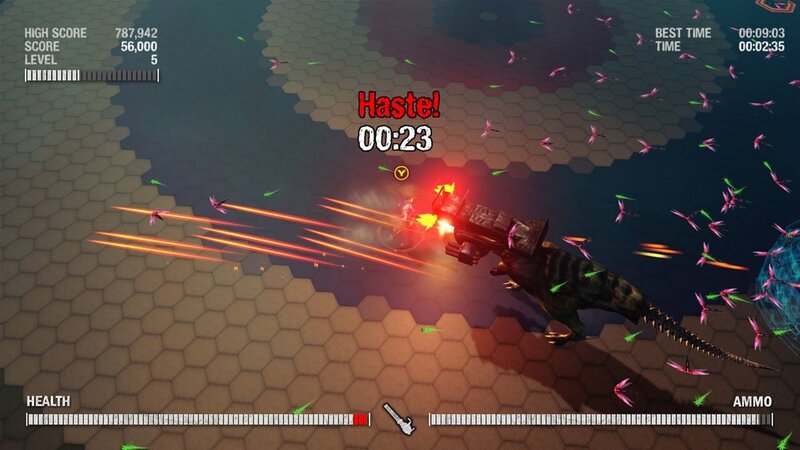 There’s also a barrage of missiles at your disposal, if things get a little too hairy. In the midst of battle be mindful however, as your standard laser can be prone to overheating if you get a little too trigger happy, in which case, be sure to switch to another weapon in your arsenal to keep providing the firepower, if you have enough gems to power the weapon that is. As an enemy is destroyed it will leave behind a yellow gem, once collected these will provide the fuel for your additional weapons. This is where G.E.M’s strategic side comes into play. Another tool which goes hand in hand with gem collecting is the ‘dash’ move. While dashing your ship becomes invulnerable and you can easily dash through waves of enemies in order to create distance between you and them or just simply to collect those precious yellow gems that have been dispersed from fallen foes. When your special weapons have run out of juice, collecting these gems is imperative. When I worked out how to balance these different aspects everything about G.E.M fell into place and I began to ‘feel’ the game as opposed to having to spend too much time ‘thinking’ and thinking is a luxury you simply won’t have when challenged with the amount of on screen enemies G.E.M delights in throwing at you after you’ve enjoyed the honeymoon period provided by the game’s first few stages. There are 4 worlds in total with 9 stages in each world, which will keep you busy for quite some time, with a new world opening up upon completing a predefined number of stages. The game’s difficulty curve is welcoming to players not familiar with this type of game and coupled with its eye catching visual style, G.E.M is a very inviting experience for casual players. While I played the PS4 version, I can see the game being a great fit for the Switch audience in-particular and also one that works well in short bursts making it well suited for a portable platform, however I wouldn’t like to play it on a screen any smaller than that of the Switch due to the size of the objects on screen and the frantic nature of the gameplay. The game also boasts a ranking system and gives you the option to upload your score to a leaderboard at the end of each stage. The ranking system will give you a rating based on several performance criteria, such as time completed, combos acquired and also reward you for the style you’ve displayed during the battle. It’s a great extra incentive for giving stages another go especially since your skills will develop the more you play. My first impression of this game was of a well-executed arcade style shooter with it’s own unique ideas, I initially saw it as nothing more than good simple fun but felt is was lacking that must-play factor. The more I played however, the more I appreciated the subtleties of the gameplay and quickly found myself entering a state where I became enveloped in the action, suddenly I could take down the waves of enemies with Grace and Purpose, knowing exactly what to do in often hectic the situations. It was at this point everything ‘clicked’, I’d become hooked and found it very difficult to stop playing. 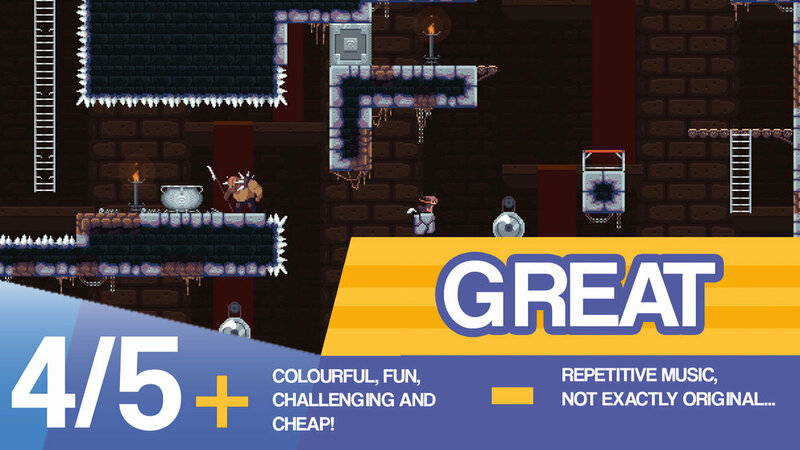 For those who try this game once and walk away thinking ‘that was good…but, something is lacking’, I’d urge you to stick with it a little longer, take the time to learn the mechanics of the game and before long you’ll really appreciate what a blissful experience Graceful Explosion Machine really is and how it is one of the best examples of Pure Gameplay around at the moment on any system. Graceful Explosion Machine for the Playstation 4 was provided to us for an honest review and is available now, as is a Nintendo Switch and PC version of the game. For more information on the game and and where to buy it from, head over here. You will die a lot. Those five words neatly explain what will happen when you play Death Squared. However you’re here for the complete package; So Death Squared is firstly a puzzle game and secondly a test on how well you can keep calm under pressure and not shout at each other*. Now sidestepping the plot for a moment I’ll attempt to explain the basics of the game. There are cubes that you control. In single player there are two (red and blue) whilst in multiplayer there are four (add a yellow and green to the mix). So the number of players varies from 1, 2 or 4. The play environment is composed of tiles with various properties and a few other ‘toys (? )’ whose actions are in response to switches or to the movement of specific player cubes. The basis of the game is to move these coloured cubes from their starting positions to their respective goals (denoted with a matching coloured circle). And with that simple premise be prepared for torture. Initially the levels are a little pedestrian. The linear routes helping to focus your attention on the obstacles you face. As the levels go by the game starts to introduce features and what can only be called ‘tricks’ that are designed to foil your progress. Part of the game’s design is that you’re expected to die since some of the traps when released are unavoidable; that surprisingly doesn’t mean it’s unfair, just designed to give you a good rubbing just when you think that you’re home and dry. Later levels open out the playfield which actually does provide a different challenge. You are now faced with the question of which way shall I go (?) and is that tempting switch part of the test or a lure to extract another fatality. The deaths you experience are totalled for each level and there is no limit to the number of lives, you just restart the level after your demise. The challenge is in solving the puzzle and remembering the solution as you negotiate the ‘dance’ that you perform with the bots to ensure their survival. At this point I’m going to veer away from the play mechanics and look at presentation. The cubes are ‘in fact’ A.I. bots and inhabit a series of test chambers. In game the inter-level sequences are characterized with audio of David, a slacker employee, and Iris his A.I. companion discussing life, the universe and well everything A.I. bot related. All this does sound very Portalesque but is very well done and sets the context for the puzzles whilst giving the player a continuing narrative (and confession time I have no idea what happens at the end – I’ve yet to finish the thing). In fact the presentation of the whole package is of a high standard with a consistent look and feel. Apart from the colour, the bots are identifiable by an increasing number of lights giving them all ‘faces’ with an additional light on the top to show which bot you’re controlling. This brings up another point about the control system. Each of the Switches controllers operate one of the Bots and can also operate one additional bot when required. So in single player each stick operates its own Bot (a note to Neon owners here – the Bot colours are OPPOSITE to the controller colours) whilst in Multiplayer you may be required to control an extra Bot by holding down the shoulder button). As you progress the levels unlock and you can revisit completed levels at any time. There is also a series of extremely hard levels (The Vault) for both single and multiplayer that are unlocked after you complete the respective sections. As I’ve not managed to complete the game yet I cannot comment on the difficulty of the bonus levels. So what lies beyond in unknown so I’ve no idea if you’d consider them a reward or a curse. So the all-important round up. Is it any good? Well yes it is but don’t wander in thinking that it will be easy or a quick game. It is a challenge and one that will keep you busy for quite a while. Now if you excuse me I’ve some A.I. Bots that I’ve got to lead to their early death. Death Squared for the Nintendo Switch was provided to us for an honest review. More information can be found and where to buy the game from, here. I have never played a game like Dogos, I’ve played similar things but never an overhead shooter with the kind of explorative freedom that this game has, and for the most part it’s a rather impressive and enjoyable game. You are Desmond and your task is to wipe-out the evil alien Zeetnuk forces through a series of 14 objective based missions. The nature of these missions, at their core, involve shooting everything in sight in your rather nimble spacecraft. You have various weapons at your disposal, ranging from a laser to take down airborne enemies to various bombing weapons to take down ground targets. You also gain access to some more powerful Special weapons, such as Homing Missiles and the super powerful Mega Bomb, a personal favourite. Your foes, The Zeetnuk, are resourceful sorts and you’ll find yourself having to take down their various small spacecraft and more deadly heavier airborne forces as well as ground targets including tanks, boats and some particularly vicious gun turrets who take great pleasure in harassing you with homing missiles. This may all be sounding rather familiar but what makes Dogos unique is that the game isn’t on-rails (at least for the most part, but we’ll come to that later). 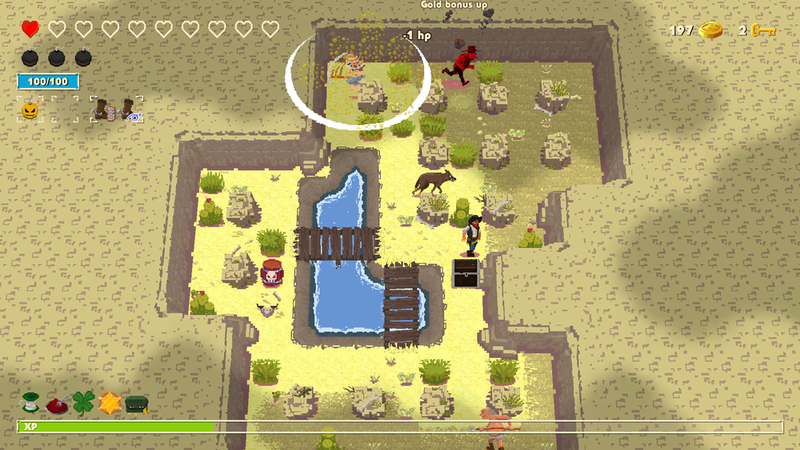 The player has the freedom to explore a rather large terrain and can call on a map to find their next objective. Most of the time, especially at the beginning of the game your waypoints are clearly marked on the map so it’s just a case of flying to the next objective although later on, especially in the last 3 missions a little more exploration must be done to find your next objective, Dogos does a great job of never letting the player get too lost either with some friendly level design. 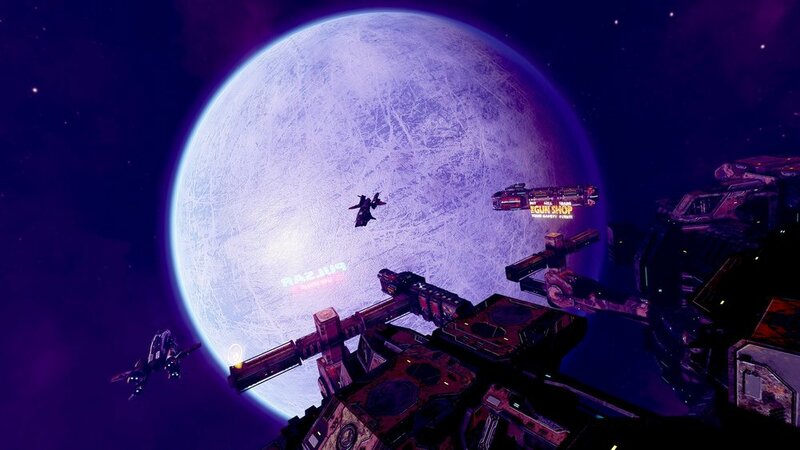 The mission objectives in Dogos vary, but for the most part involve bombing the Neetnuk’s nefarious facilities, usually taking down shield generators or reactors in order to eventually take down a bigger foe. Some of the larger foes in the game include a large battleship and an armoured, heavily weaponised train. Movement is a twin-stick affair; the left stick is your throttle while the right stick turns your ship. This works well in practice and allows you to easily weave your way around the enemy’s hail of laser fire with ease. As the game progresses it introduces some rather tricky obstacles, such as beam doors, which flash on and off giving you a small opportunity to fly through, only to be faced with a series of even trickier barriers. There’s plenty of this close quarters beam dodging, which can be frustrating at times, especially as you manage the ships momentum (it never stops dead when you want it too). However, you will gain improved control of your ship as you play, rewarding practice and patience, and while Dogos may seem harsh in places, it is always fair. It’s certainly an accessible game and frequent checkpoints really help levitate the game’s more frustrating challenges. Dogos occasionally shakes things up with high speed ‘on-rails’ sections where you have to pilot your craft through a dangerous series of canyons or tight corridors, sometimes while bombarded by various other obstacles that appear in your path. These sections are few and far between and while they give the game a much needed sense of speed (a boost button would be a nice to have), they are sometimes frustrating and often feel unnecessary. 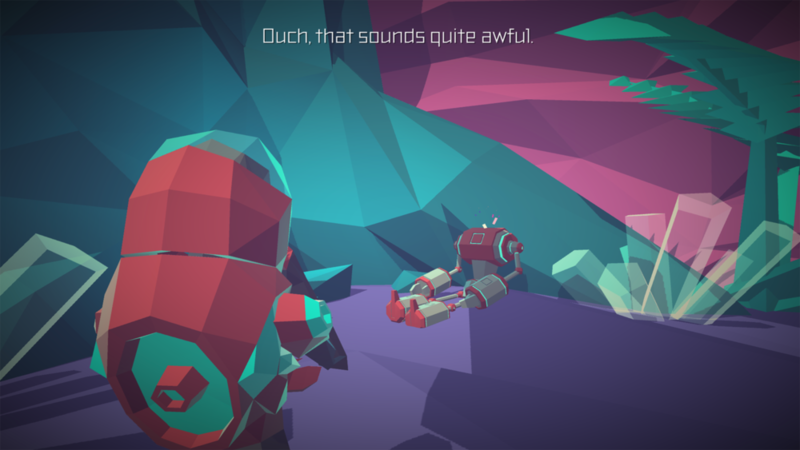 Later forced on-rails sections seem to delight in throwing obstacles in front of you with little notice, giving the player a fraction of a second to react. With a bit of patience, you’ll make it through these sections but they can be frustrating and the sudden change of pace can also be a little jarring. There is no doubt that the core shooting mechanics of Dogos are very enjoyable though and there’s a variety of weapons to unlock too as you progress in the game. These can give you a nice tactical advantage in places. Once you get the ‘Spitfire’ laser and Cluster Bombs though, you have a winning combination. The game even attempts at having a narrative that can be followed by listening to Desmond narrate his Diary between levels, it’s a rather simple story with little depth or deep explanation but what it succeeds in doing is giving the player a motive for destroying the game’s hordes of enemies. Desmond sounds like a man who has little hope and his narration is delivered in a suitably appropriate manner. It’s a nice little touch, as is the dialogue Desmond has with his ally, Europa during the game’s missions, which peppers the game with a touch of humanity. Having said that these sections could be better implemented and cut scenes would greatly enhance the proceedings. As mentioned previously, the game is spread across 14 levels, which include a good variety of locales, from the distinct desert canyons of the first couple of levels, to volcanic caves, tropical stormy seas then eventually into the inner workings of a Zeetnuk spacecraft where you take down the game’s final boss. The game doesn’t really excel in boss battles sadly though and there’s a feeling that it could do with a few more, at least a little more variety would be nice (you fight the rather underwhelming ‘Goliath’ a total of three times during the games final missions). What is here though is satisfying enough, plenty of projectile dodging ensues but the bosses do have a bad habit of overstaying their welcome and occasionally go on for what feels like an age. A life bar would be a welcome addition for sure. Worthy of note are the game’s graphics, this is a nice looking game for sure, not only from a graphical standpoint but from a design standpoint also. All the vehicles in the game have their own distinct personalities and everything on screen is very easy on the eyes. The game’s colour palette is refreshingly bright and while the graphics are certainly of this generation they also have a retro throwback feel, provoking nostalgic memories of the bygone Amiga era. Musically Dogos is rather underwhelming, the game has a limited soundtrack comprising of a handful of tracks that are re-used far too frequently and often don’t represent the fast paced nature of what’s going on in the game most of the time. A more dynamic soundtrack would help elevate the game’s atmosphere immensely. While some of the tracks are fairly enjoyable to listen to they don’t change up enough when needed and sadly, Dogos ends up feeling flat in the music department for the most part. In summary, Dogos does a lot of things very well. It has great graphics, satisfying finely tuned controls and nice level design but falls flat in other areas like sound, variety and overall presentation and wow-factor. The frustrating thing about Dogos is it’s almost all there, just the pieces aren’t meshing together as well as they could be, with a few more varied mission objectives, a more dynamic soundtrack, better boss battles and overall greater coherence and polished presentation Dogos would certainly be 'Top Dog'. As it stands though Dogos is a solidly crafted shooter which offers up a refreshing change of pace when compared to other games of its ilk. I strongly recommend that you give Dogos a go. It provides a rewarding, unique and accessible shooting experience that has some nice challenge, it’s a good length too, providing about 6 hours gameplay to complete the main story and then an incentive to play though the levels again to complete extra challenges. What I really hope is that enough people try this game to encourage a sequel, as I feel it wouldn’t take a lot more to make this game a top drawer title. DOGOS is available NOW (Sept 6) for download on PS4 and from Sept 7. for download on XBOXONE and STEAM platforms. A Blast from the past Process. Today we look back at an old classic. Sega and Warner Brother Interactive present a Monolith Productions game, Condemned: Criminal Origins. Originally produced for Xbox 360 in 2005, this game has been available on Steam for a while. The graphics are a little dated but we are going to see if it still packs a scare. The game opens with a death investigation with two FBI agents. I play as Agent Thomas. Evidence is gathered at the crime scene. The crime having been committed by a serial killer called - The Matchmaker. He is known for killing women and setting them in a scene with mannequins. It becomes apparent that the homicide suspect is still in the building. The game is a bit like 'CSI'. It is the player's responsibility to check the ammo in the gun as there is no on screen prompt. If you forget to do this, you can resort to kicking encountered enemies. Over the introduction the player is gradually introduced to various abilities. Glimpses of the past hint at what has happened. Early in the game the player looses the firearm and instead has to resort to using found weapons, pipes, wood etc. This gives a unique feel as the majority of games allow you to carry a whole bag full of weapons and found items. The game is more about counter attacking rather than going in with weapons swinging. You need to counter the enemy moves in order to take them down. Even during the combat sections, there is still investigation to be done with the characters wide array of gadgets and tools. The environment is suitable scary with rats scuttling in the shadows. The only way to obtain health is to smash open first aid lockers found at various points in the game, although are hard to come by so keeping healthy could become a struggle. Secrets can be found off the beaten track and finding these unlocks achievements. Only one item can be carried at any time and so making the choice between gun, fire axe or other weapon is important. As in real life, the different weapons have different effects. The Taser is a good weapon for bringing down enemy characters temporarily. At the end of each chapter, the game gives you a breakdown of your favourite weapon, how accurate you have been and what secrets you have found. Meaning people who want to 100% the game can try and improve their detective technique before moving on to the next stage of the game. I managed a fairly abysmal 40% accuracy on my first walkthrough. Chapter two sees FBI Agent Ethan Thomas awakening in a new setting and suffering from strange hallucinations. An old friend of his fathers informs him that the death of his colleagues last night is thought to be of his doing after the killer used his gun. Ethan proceeds to go on the run, leaving his apartment as the police begin to knock on the door. Ethan flees into the subway and though abandoned buildings. Moving through a variety of settings makes the game feel realistic. Even running, Ethan does not move overly fast as you try and find somewhere safe to go. Ethan holds on to his phone as he still has some friends back at base. A slight bug in the game play as a character I encounter manages to walk through a wall in order to attack me. This was a one off incident during our time playing the game. Ethan manages to get hold of another gun, hinting that there will be an occasion coming up where he needs to use it. Exploring the environment is made all the more challenging as enemies turn off the lights and use the environment to their advantage. During the game play it did feel a bit like I was going around in circles, but there was enough to keep me interested. Some backtracking is required to collect the required items, however, there always seems to be a weapon close to hand when the need for combat arises. The sound files in the game are realistic and certainly enhance the game play. At some points in the game it is tricky to know what you should be doing, but the game will lead you in the right direction. It proves a little challenging to investigate and attack enemies at the same time. If anything, I'd like more of the investigation and less of the combat. Although enjoyable to play, it does feel a little drawn out at times. For an eleven year old game it still holds up today with both action and scares. For anyone who wants to live the life of an FBI agent on the run, this game will be right up your alley! An offering from Hush Interactive which describes itself as dark footage, first-person horror. This is right up my street as you may have already figured out from my previous horror themed reviews. At 54p in the Steam Sale (price correct as of 24.8.16) it would be a crime not to give it a whirl. From the title screen the found footage style is apparent from the interference and scan lines making you want to fiddle with the tracking on the VCR. This takes me back to many a time trying to get my old copy of Return of the Jedi working and also invokes films such as Paranormal Activity. Xbox controller or keyboard can be used to play through the game. Eerie noises and sound affects echo out from the loading screen, this is a good start! The game consists of four chapters, each admittedly quite short, but this is a bargain basement priced game and sometimes it is nice to complete a game in one sitting rather than battling with it for weeks! Chapter 1 - The Interview. Starting out with a voice recording, it hints at many a horror film. The character hears about a job at an old nursing home and wanting to make her father proud, she sets out. Moving from this introduction screen, we are now exploring the new place of work through a distorted 80's camcorder. The game looks like you are playing a found footage film; shaky and poor quality. While this makes it difficult to see what is happening, the very fact you cant see what is happening, is indeed what makes the game scary. Similar to Outlast, you view the game through a video camera, the only light being that of your mobile phone. Walking around the environment you can find notes and recordings for additional fluff and story. The entire game has that camcorder grain like you are watching a VHS recording. Seems unusual that the character has a modern phone, but an old VCR camcorder. Maybe I'm overthinking things as this certainly doesn't detract from the game itself. The game has some spooky concepts. Entering a ward in the hospital it is slightly unnerving to find the beds filled with inanimate mannequins. This is escalated when you start seeing apparitions! The sounds are weird, almost verging on a low rhythmic chant at times. No form of map does make it a bit unnerving and certainly more realistic. This was a good touch. So many branching corridors indicates there is lots to explore. Random notes on the door are freaky and give some context to the exploration. Interacting with one door, uncovered a puzzle which needed to be solved before the door unlocked and allowed me to proceed. I wasn't expecting any puzzles within the game, so this was a nice little touch to break up wandering around in the dark holding my breath! I was looking forward to more puzzles as the game progressed, however, this was the only one. You can run in the game, however, the character puts down her light while doing this making it more difficult to see what is happening. Do you want speed or light... that is the question?! What really adds to the atmosphere of the game however, are the audio recordings that you stumble across where you hear about events that have transpired and gives your exploration in this first chapter some context. After running from a freaky shadow figure (who is naturally crawling along the floor in homage to The Ring), we get to Chapter Two: Down Memory Lane. The second chapter is played though the eyes of another character. What is a nice touch here is that the character doesn't initially see through their own eyes, but instead through the camcorder viewfinder. This does leave a lot of eerie dark space around the screen. The character can switch between camcorder and flashlight.... without giving too much away, different things can be seen using different pieces of technology. A great touch! 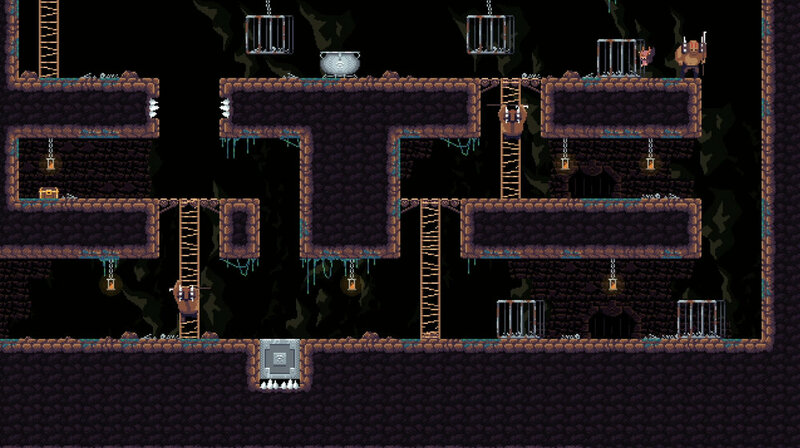 This second level has a very quiet music, the main sound being a repetitive noise, not at all unsettling! (At least that is what I am telling myself!!) As it gets louder, you know that soon death will be your friend! I think if I were to reply, I would do so with headphones as feel this would make the game more atmospheric. In terms of graphics, the rooms are very 'samey'. This makes it confusing in terms of remembering where you need to go and where you have already been. This adds another level of frustration. Chapter Three: Deep Below returns to the character we met in Chapter One. Some of the voice acting is not the greatest, however, this can be forgiven given due to the cost of the game. Chapter 2 was a nice concept, but not as good; try and get through it. The female character is more unsettling, and strangely, more enjoyable to play. Some backtracking involved once you've found certain triggers to unlock escape routes, but not excessively so. As soon as getting back into the swing of things with this character, the chapter ended, making this the shortest chapter in the game. Chapter Four: A Dark Past. The same character. Not quite sure why this couldn't have been merged with Chapter Three. Chapter Four has the same goal of collecting things as chapter two. Not quite so interesting the second time around, especially as I can now see everything again being able to use phone (light) and camcorder at the same time. Finding photos in series of very similar rooms, is neither fun nor scary. In summary, the game cost me 54p for 30 minutes of entertainment and I can't grumble at that. It is a good hint at what Hush Interactive may be able to produce in the future, however, focussing more on the scares and less on the running around and collecting things and this game would have scored higher in my opinion. It started with a good concept, but it ran out of steam becoming a bit too samey near the end. My final thoughts after completing the end of the game was it was boring in comparison to the promise the first half showed. The Final Take is available on Steam and currently on offer for 54p. (Normal price £1.59).